The Horizon RD-4055 Rotary Die Cutter is designed to meet the growing demand for short-run die-cut product with its ability to die-cut, crease, perforate, slit, hole punch, and round corner in one process for digital and offset printed sheets. Easy-to-use touchscreen: This system features easy change-over and simple operation. Both setup and control can be done through an intuitive touchscreen that displays easy to understand graphical illustrations. Double-feed detection: The RD-4055 features a vacuum belt for superior feeding and an ultrasonic sensor for double-feed detection across a wide range of substrates. Simultaneous cuts: Die-cutting and kiss-cutting can also be performed at the same time, which makes the RD-4055 ideal for producing stickers and labels. 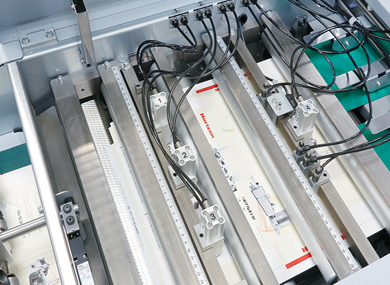 Eliminate image cracking: Creasing can be achieved to avoid image cracking making the system suitable for boxes, pocket folders, and greeting cards that require an additional folding process after die-cutting. Reduce costs: A “repeat register” function allows multiple-up applications from a single-up die to minimize costs. Even run up to five repeats in a single pass! The SPC-4055 removes the waste from the finished product and delivers it to the waste bin. 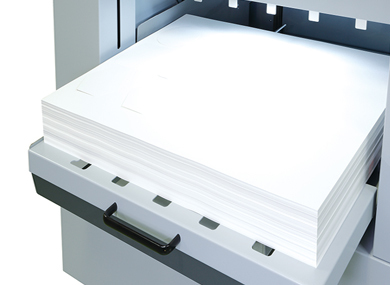 The optional ST-4055 stacks a wide range of substrates and applications such as thinner sheets or complicated shapes which can be difficult to separate.